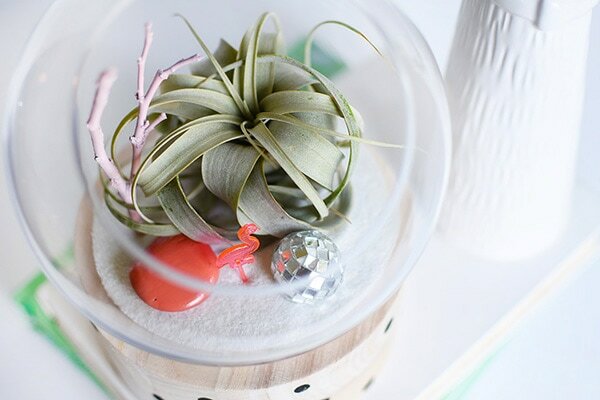 INSIDE : A modern take on a traditional plant terrarium! Painted Crosses, Scallops and Polka Dots add the perfect pattern to the wood base. 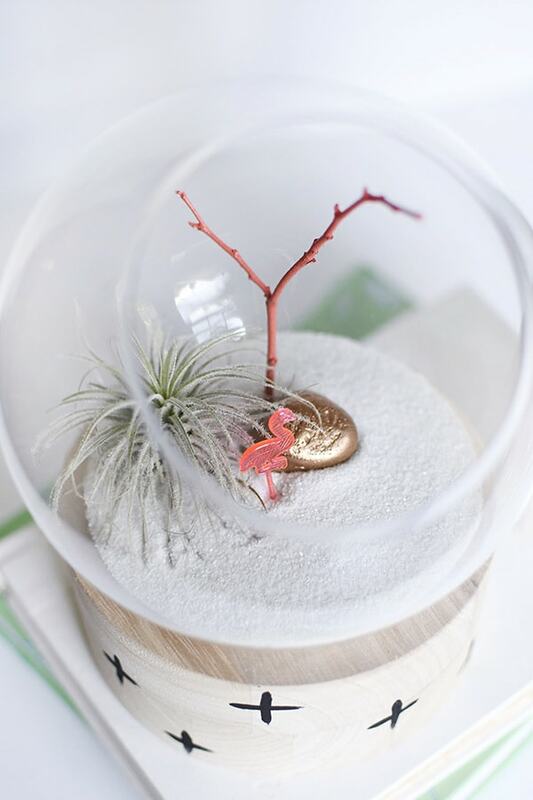 Learn how to create this trendy DIY using air plants, disco balls and mini flamingos. A few weeks ago on Instagram Stories, I professed my love for an upcoming DIY plant related project. I am fairly certain I said it was my favorite DIY to date and those are strong words. But, I also get really excitable when I am… excited, ha. 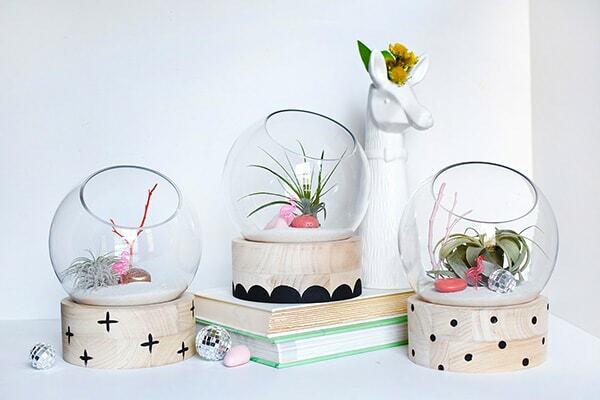 Today is the day, I share my favorite DIY, my Modern DIY Terrarium containers. Terrariums can come in my different shapes and sizes. They are typically a glass container that mimics on a smaller scale a greenhouse. Due to a small opening, much of the moisture from the plants stay contained inside the terrarium creating ideal growing conditions for many plants. These three modern terrarium beauties I made are currently sitting in my living room and I have wanted to share a picture for weeks, but had to wait until the post was revealed. How can you go wrong with crosses, polka dots and scallops, though?!! I think these containers from Oriental Trading almost have MidCentury Modern look to them. 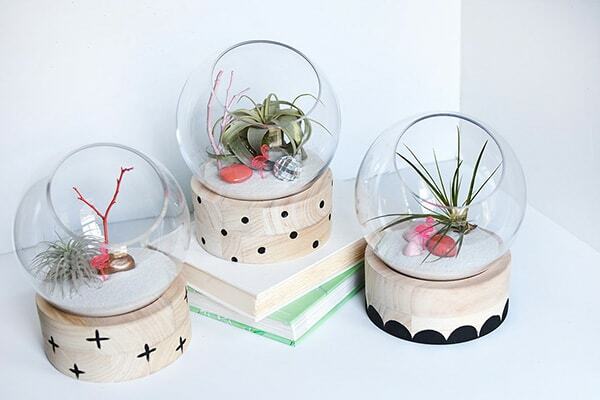 And what makes these modern day terrariums so modern? Well the patterns painted on the wood base definitely give them a very trendy modern look. 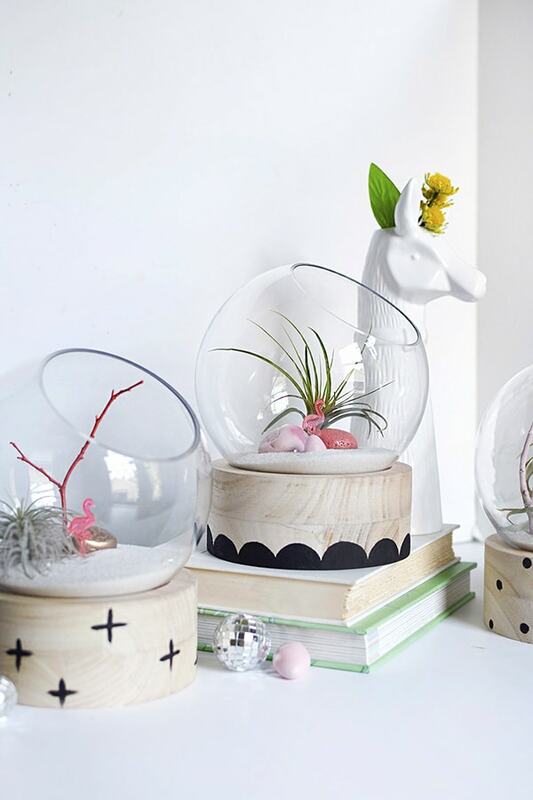 And then pairing more modern plants like air plants and succulents are perfect for terrariums. 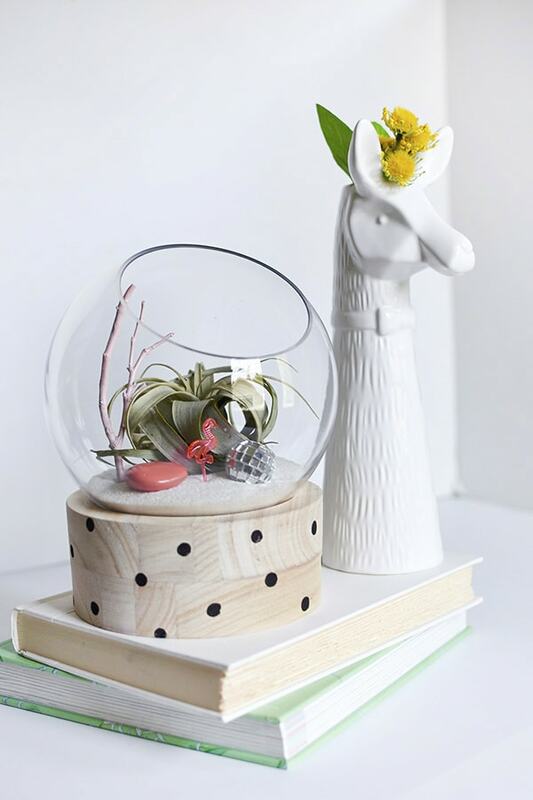 And then filling your containers or terrarium jars with awesome miniature items simply takes it just to the next level! Interested in some of my other amazing plant crafts? I can’t get enough of the adorable pink flamingos and everything is better with a few disco balls. Please head over to Oriental Trading’s blog to see my full supply list…. I REALLY love how these turned out and their terrariums are a dream to work with! 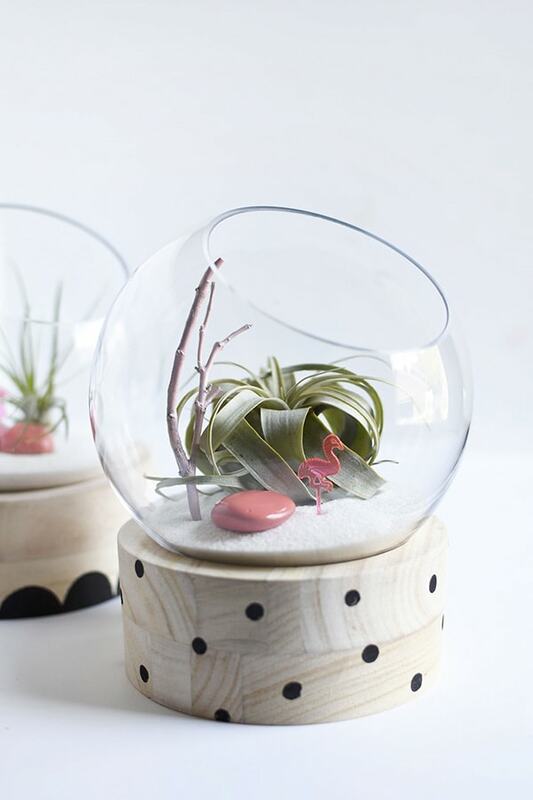 Plus the wooden base of these glass terrariums is so substantial and they feel very quality. I bought three but I kind of what three more! I love the simple color palette, too. Pinks, corals, golds, blacks and white… the colors that make me so happy! 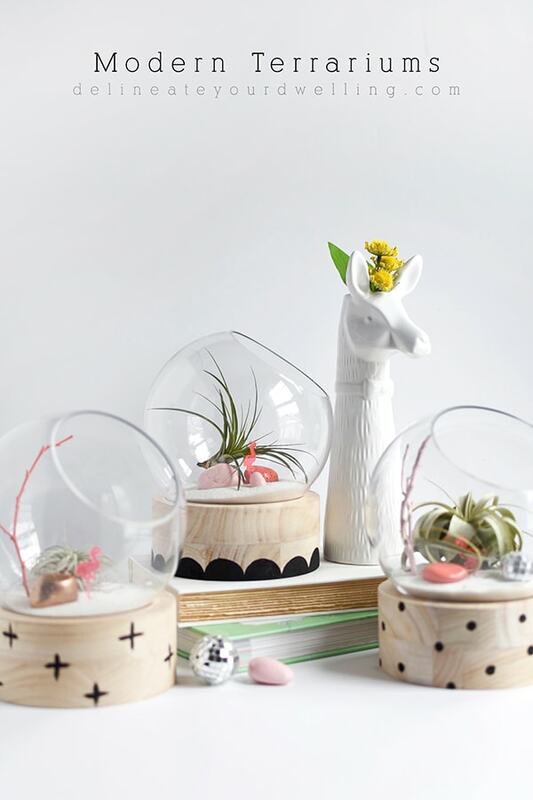 And be sure to see the full step by step tutorial for these colorful Modern DIY Terrariums, head to Oriental Trading’s blog. And if you’re curious to check out all my Oriental Trading projects, head over here! Are you looking for other plant crafts and DIYS? I’ve only got a million for you. Wonderful work !! They are so great! I’m going to do this this week! How great! I’d love to see how they turn out! 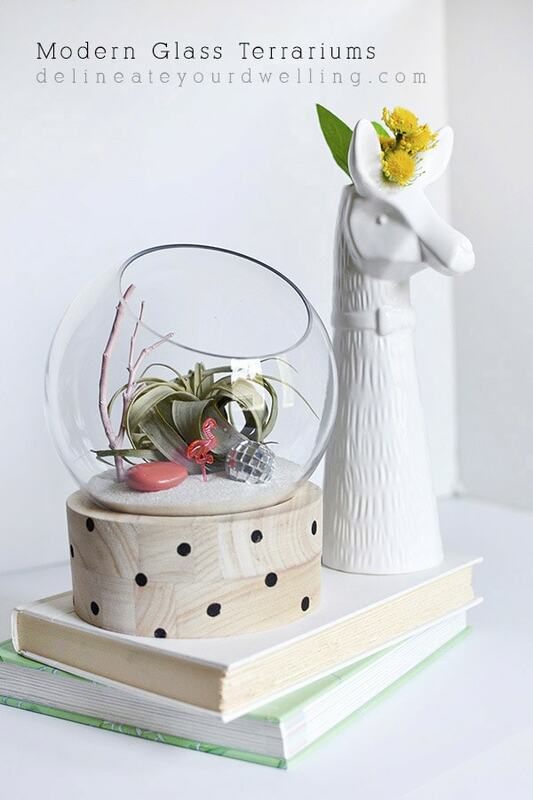 These are gorgeous and make a wonderful statement with the 3 terrariums grouped together. The simple design is sort of minimalistic, and the details of the brightly colored items really pop in a subtle way. The terrariums are BEAUTIFUL!!!! I love the colors…. You did wonderful!!!!! You are the sweetest, Teri! I really loved the quality of these wooden bases, too. My terrariums are sitting proudly on my mantel!